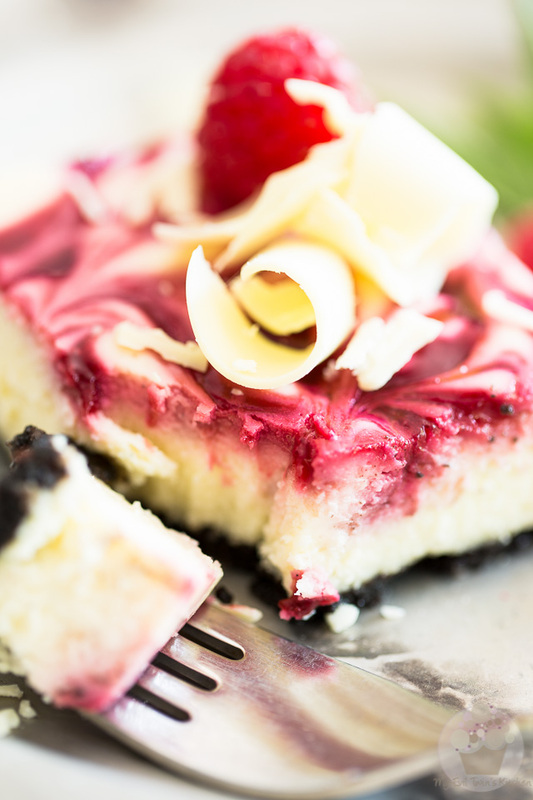 An irresistibly delicious combination of sweet Oreo cookie crust, creamy white chocolate cheesecake and a beautiful swirl of raspberry puree. Ever since I can remember, raspberries have always been my favorite fruit in the whole wide world. Cherries come in at a close second, followed by strawberries and blueberries. But raspberries totally come out a clear winner. Always have, always will. As for desserts, cheesecake clearly sits at the very top of that list, without even any close second. 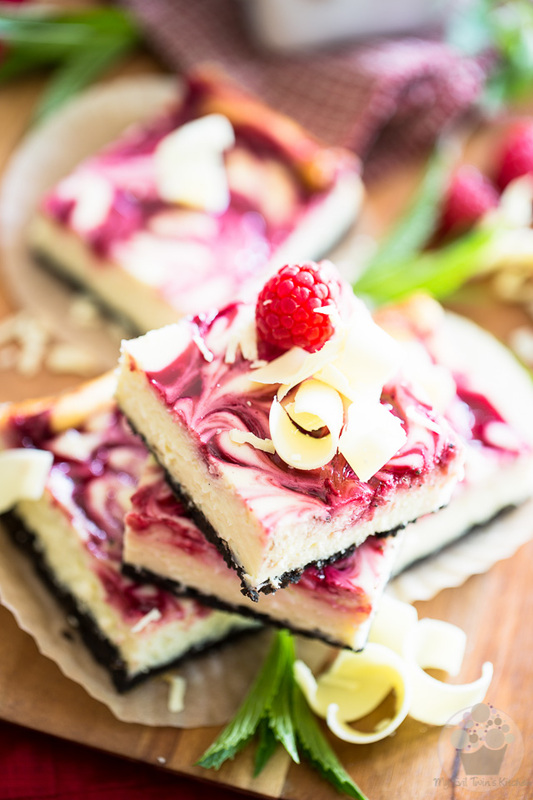 Why I never thought of bringing the two of them together and create something like these White Chocolate Raspberry Cheesecake Bars before now is totally beyond me. 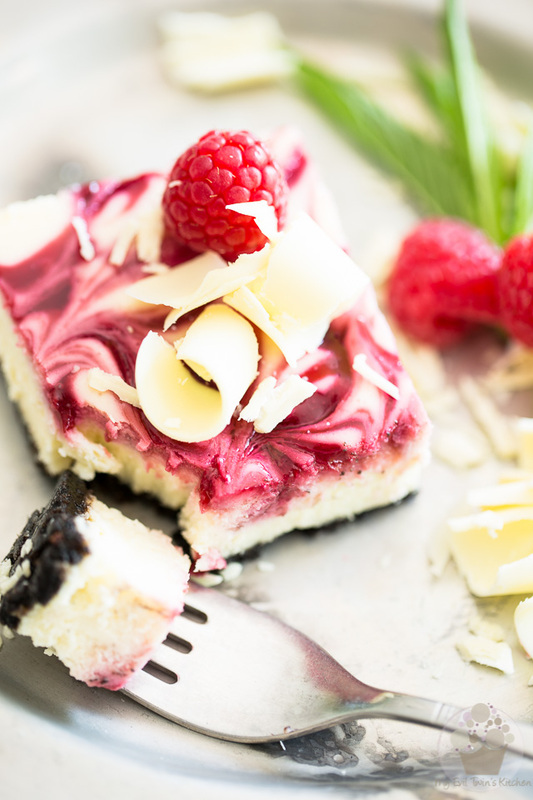 In fact, it wasn’t until I stumbled upon Ashley of Baker by Nature’s recipe for a White Chocolate Raspberry Cheesecake that the idea of pairing those 2 favorites of mine started to take form in my mind. And then, a few days later, I got Ashley’s recipe for Blackberry Cheesecake Bars delivered right to my email inbox. That was more than I could handle! At that point, I just couldn’t wait any longer and had to experience that magical union, right then and there! As luck would have it, raspberries also happen to be in season in my part of the world. They had just gone on sale at my local grocery stores and were going for a ridiculously low price, so I’d practically bought a truckload! But then, I was faced with a very serious problem: I just didn’t know which recipe to make! Both looked so incredibly delicious! 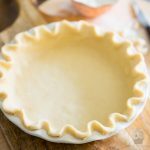 I loved the idea of adding white chocolate to the cream cheese batter, but I equally loved the idea of using Oreo cookies for the crust! To solve this very crucial dilemma, I decided to merge the two recipes together, and to also throw a little bit of my White Chocolate Lime Cheesecake into the mix. And then, I took another very important decision: even though I had my fridge full of fresh, juicy raspberries, I eventually opted to use frozen raspberries instead. Why? 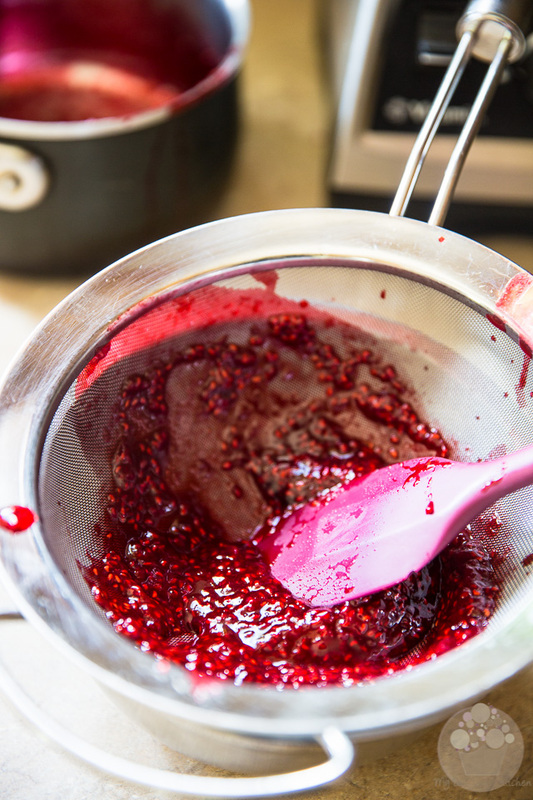 Because I find frozen fruits tend to release a little bit more liquid as they thaw, so they would give me a little bit more raspberry puree for the same amount of effort… but mainly, I think it’s just that I couldn’t bring myself to “waste” my favorite fruits by turning them into a puree. Raspberry season doesn’t last long and I much preferred eating them fresh, by the handful, straight out of the container. That’s by far my favorite way of enjoying them! Using frozen fruits also means that I (or you!) 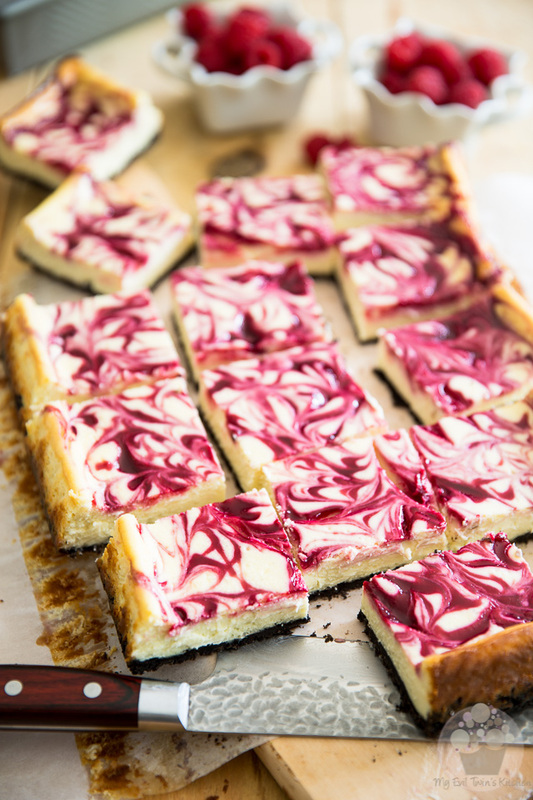 can make these White Chocolate Raspberry Swirl Cheesecake Bars anytime of year; no need to wait until raspberries are in season. That said, you could very well use fresh fruits if you preferred to. They would work just as well. 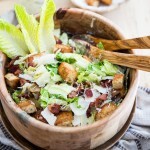 Besides, fresh have a clear advantage over frozen when it comes to garnishing! 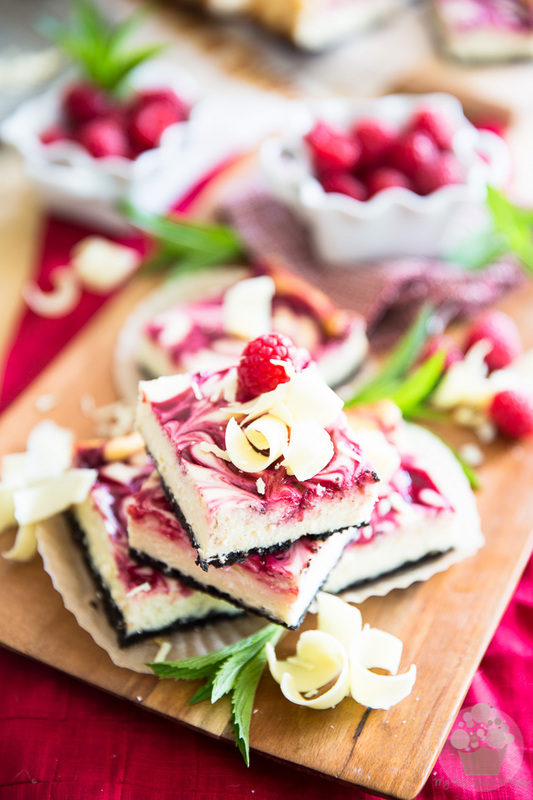 I don’t think I need to tell you that these Raspberry Cheesecake Bars are one of the best things I’ve ever eaten and that I fully intend on making them again, and again, and probably again, too! 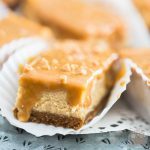 And eventually, I just know that I’ll have to try the totally drool-worthy“original-full-on-cheesecake-version“, and when that happens, of course I will have to share with you! Until then, I strongly recommend that you give these babies a go. 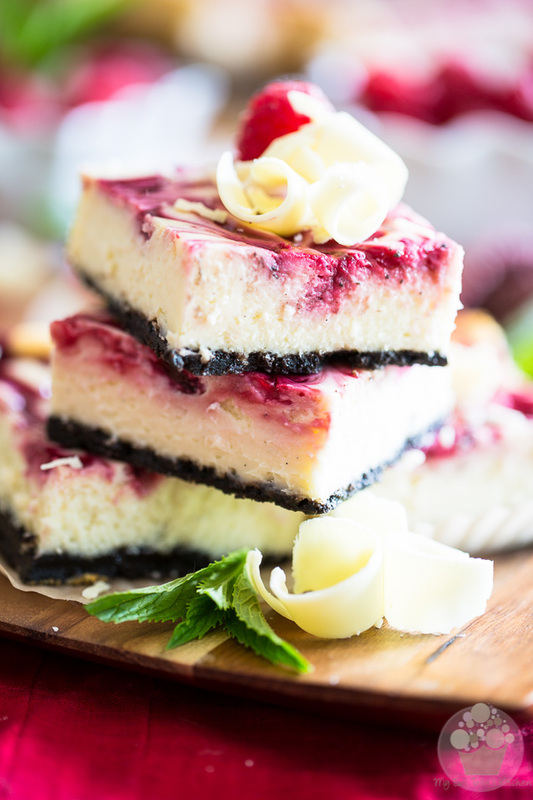 The combination of the sweet, buttery and crunchy Oreo cookie crust, the silky smooth, creamy and slightly tangy white chocolate cheesecake and the refreshingly-tasty-and-super-crazy-elegant swirl of raspberry puree will totally rock your world, I swear! 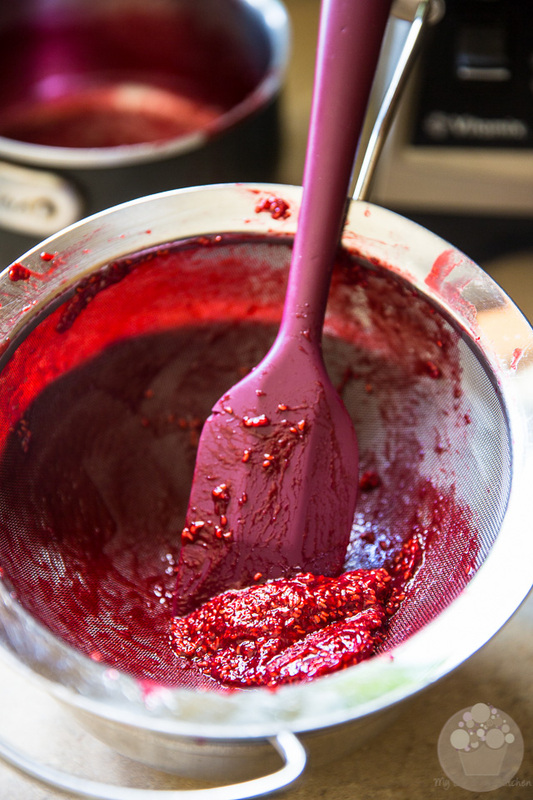 I chose to use frozen raspberries, but like I said earlier, you could also use fresh. They may yield a little bit less puree as they may not release quite as much liquid as the frozen ones, but you would still have plenty to go, don’t worry. 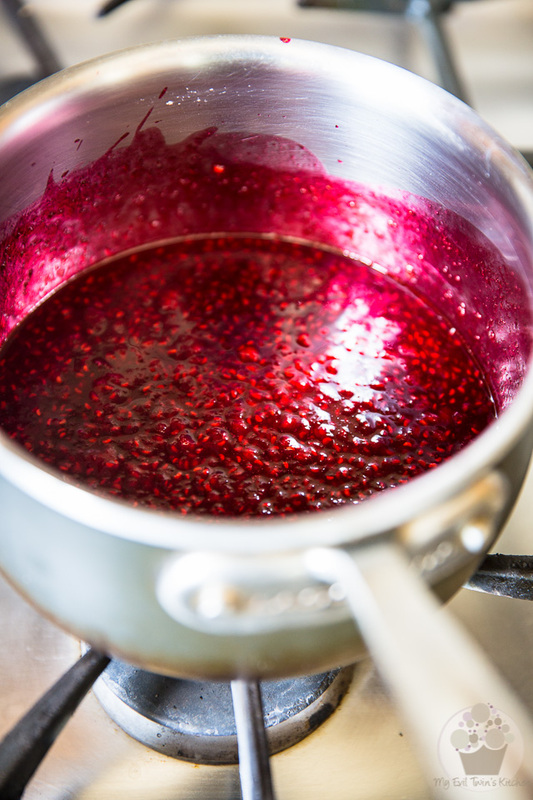 Bring to a boil over medium heat and cook until the raspberries are completely reduced to a jam-like puree. Allow the mixture to cool for a few minutes and then force it through a fine meshed sieve to catch all the seeds and pulp. This step isn’t absolutely mandatory, but I strongly recommend that you go through with it. 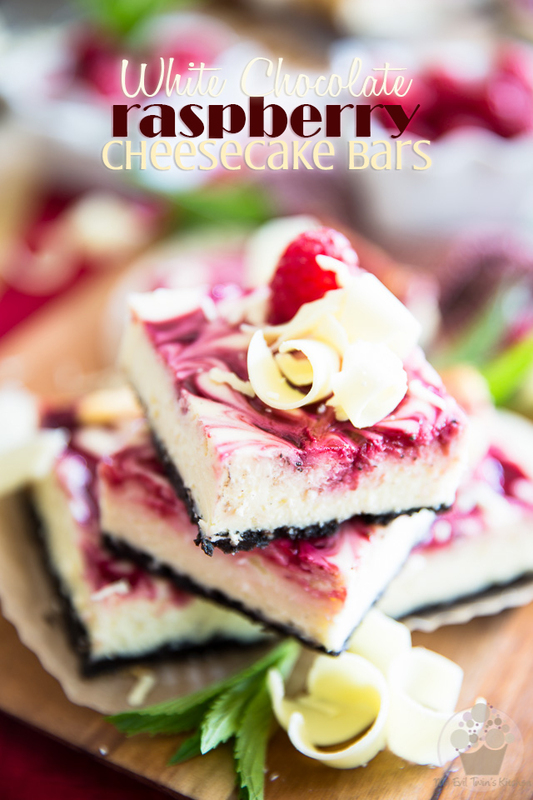 While I have nothing against raspberry seeds in general (except for when I have one that’s annoyingly stuck between my teeth and obstinately refuses to abandon its hiding place) I think that they would somewhat ruin the lusciously smooth and silky feel that these cheesecake bars have in your mouth. I agree, the process is a bit strenuous but trust me, it’s entirely worth it. This is pretty much all that should be left behind when you’re done pushing down all that raspberry “jam”. Make sure you don’t forget to scrape the underside of your sieve: there will be A LOT of that smooth puree trapped in the fine mesh. 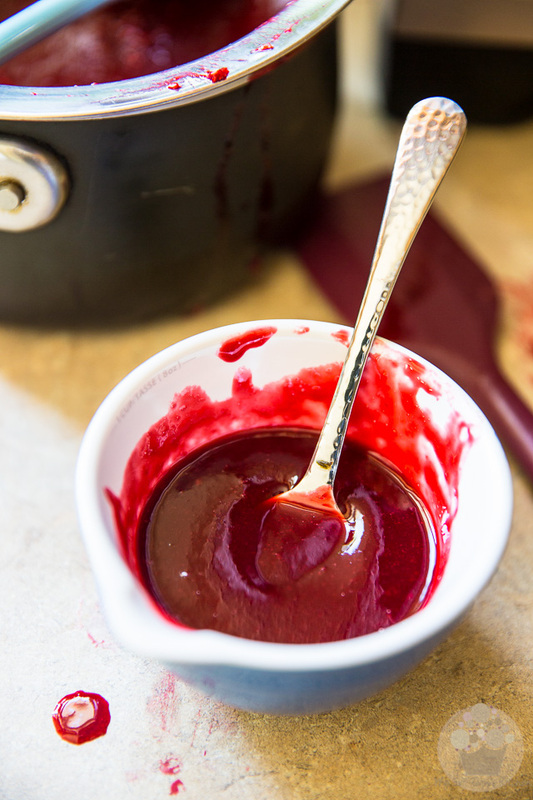 This, is the beautifully smooth and silky, ruby red raspberry puree that you will be left with when all is said and done. It may not look like much, but it will be more than enough. 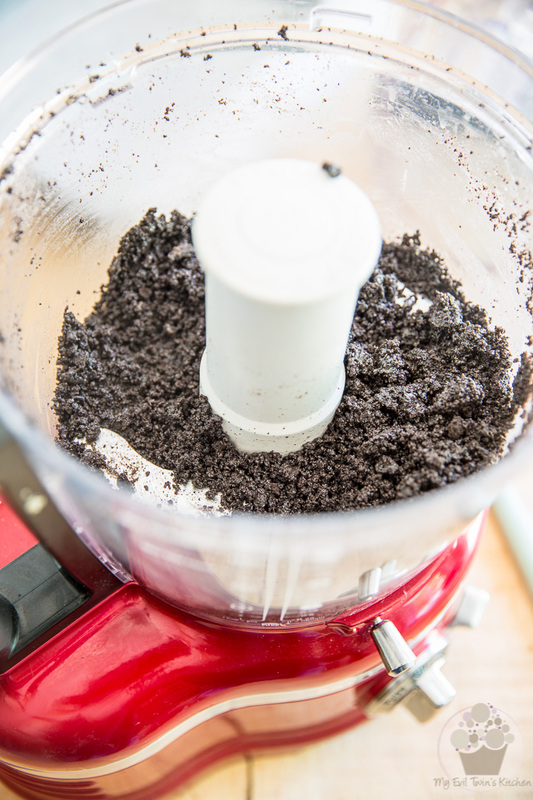 Process until the cookies are reduced to fine, wet crumbs. 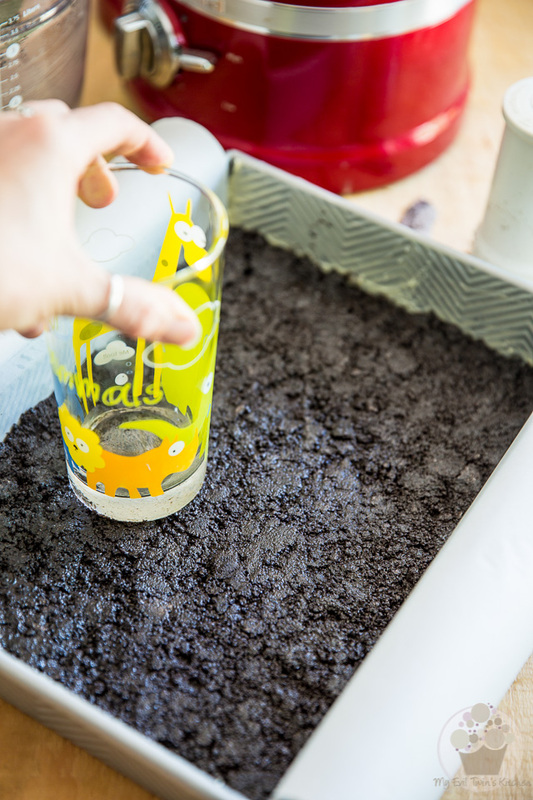 Press this mixture firmly at the bottom of the prepared baking pan and set aside. 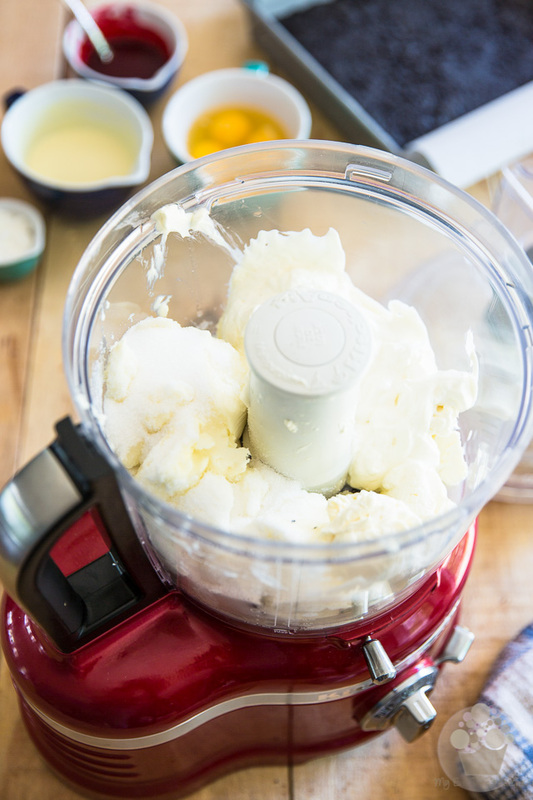 Combine the softened cream cheese, sour cream, granulated sugar, lemon juice and vanilla seeds in the bowl of your food processor. It might be a good idea to rinse it first, so you don’t end up with all kinds of cookie crumbs in your cheese batter. The only black specks that I want to see in mine are those of the vanilla beans! I love those so much, I use fresh vanilla every chance I get mainly because of that. Well, and also because of their unbeatable flavor, of course. If you didn’t have fresh vanilla beans, however, feel free to use pure vanilla extract, instead: a teaspoon or two will definitely do the trick. 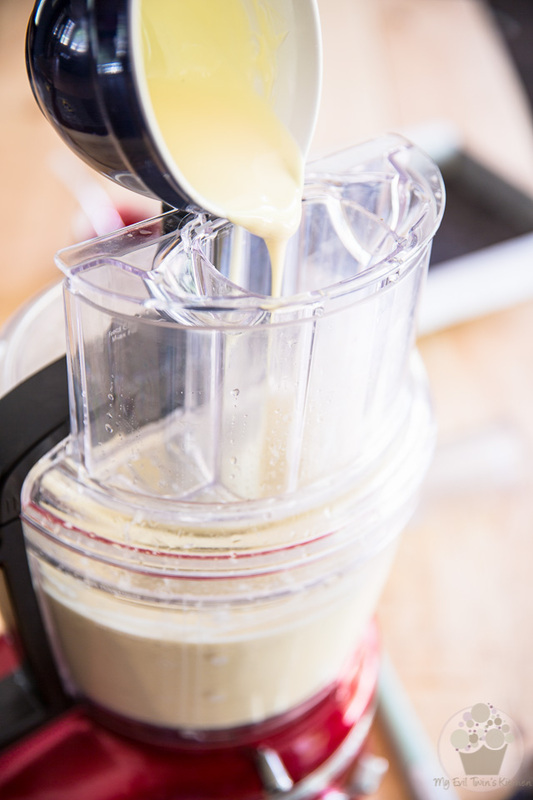 Process until the mixture get super smooth and creamy, about 3 minutes. 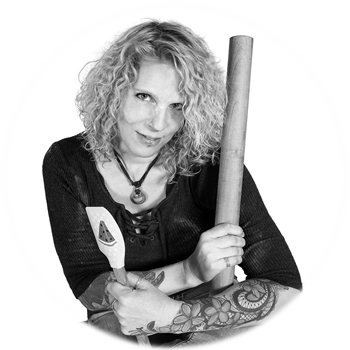 Stop the motor to scrape the sides once or twice to make sure every last bit gets incorporated. …followed by the 2 tablespoons of corn starch. Resume beating until the newcomers are well incorporated, about 30 seconds. 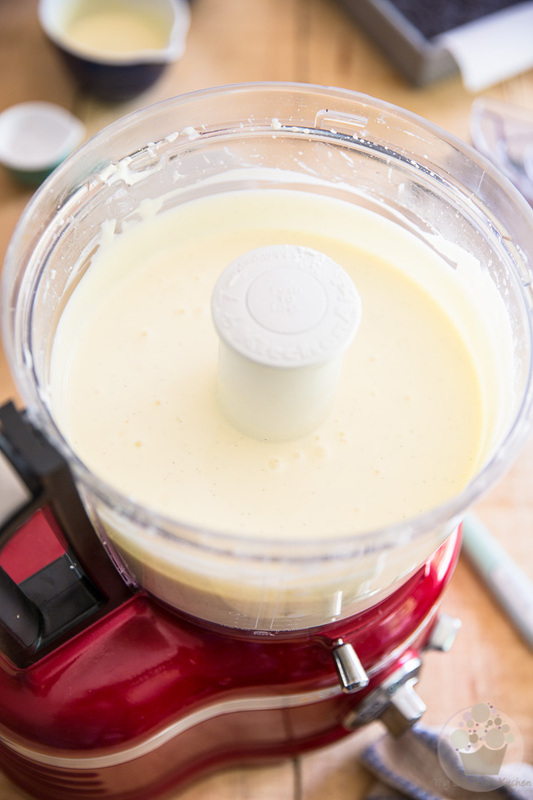 While the motor is running, pour the melted white chocolate through the feeding tube and mix until fully incorporated. My favorite method for melting white chocolate, or any kind of chocolate for that matter, is in the microwave. What you need to do is chop your chocolate super finely and then place it in the microwave for 30 seconds. Then, let it rest undisturbed for 30 seconds and finally, stir delicately for 30 seconds. If there are still lumps of unmelted chocolate left after that, repeat the process but for 20 seconds this time, and continue doing that until the chocolate is completely melted but not hot to the touch. 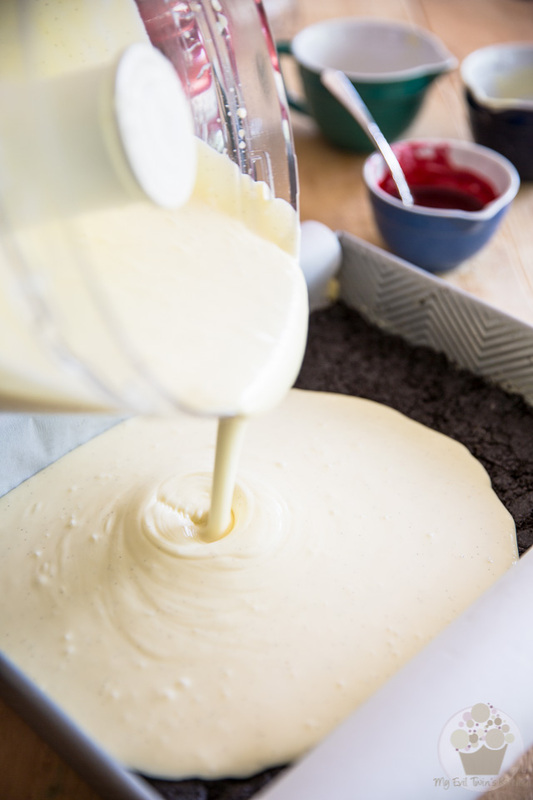 Pour the white chocolate cheese mixture over the reserved crust and spread it all the way to the sides. 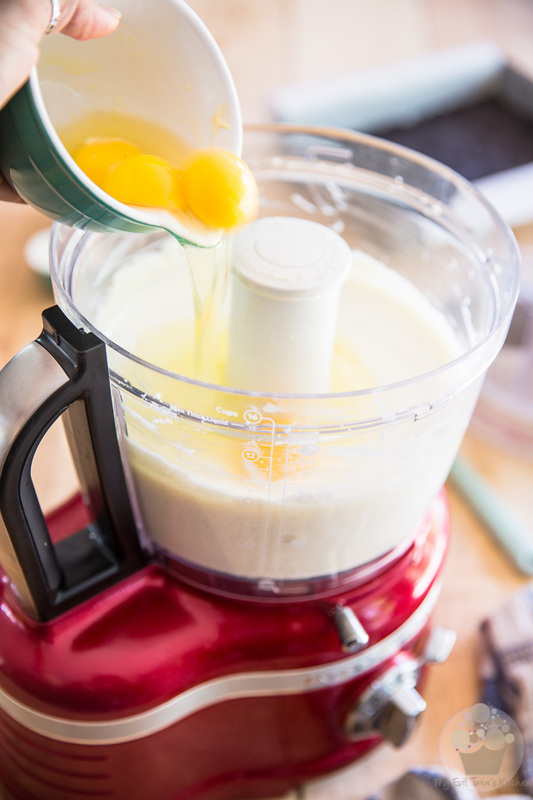 The batter will be fairly runny, so there shouldn’t be much spreading to be made; maybe just give your pan a little shake and a gentle tap or two to help smooth the top. 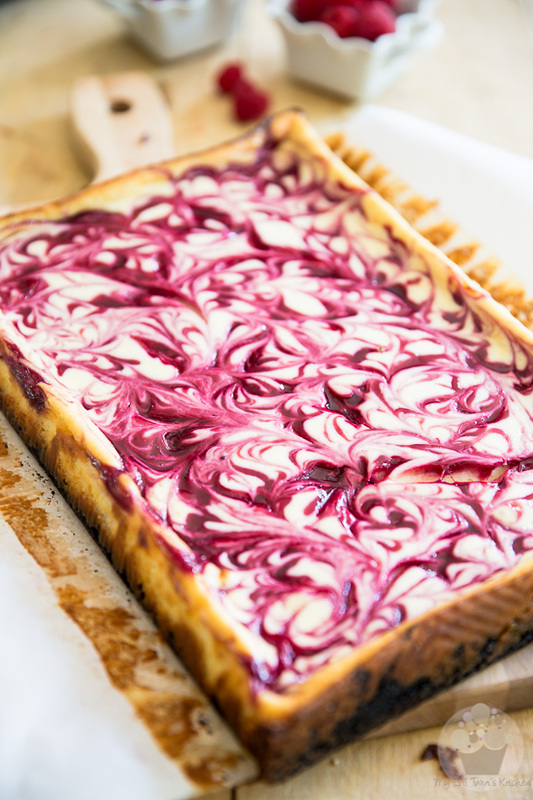 Now grab a spoon and delicately drizzle that beautiful raspberry puree all over the top of the cheesecake batter. 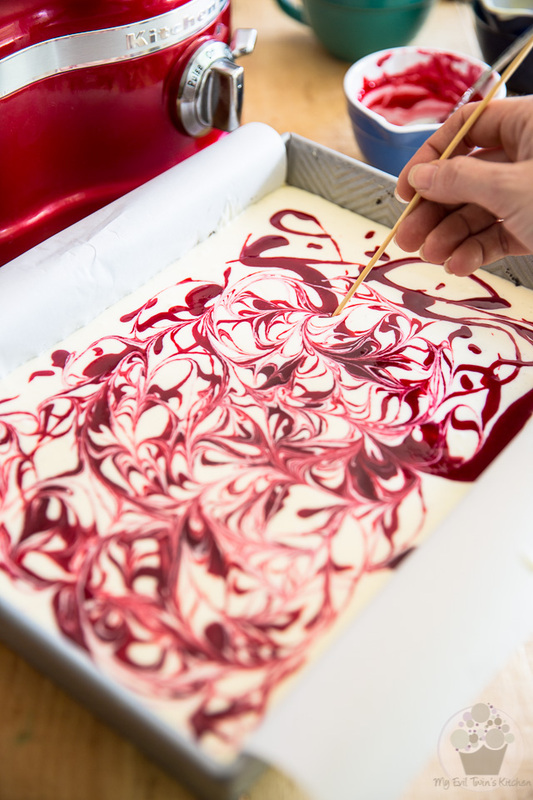 Make little swirls in the mixtures with the help of a wooden skewer. Try not to make contact with the bottom with that skewer, else you might end up damaging the crust. Bake the bars for about 40 minutes, or until the filling is set and golden brown around the edges and jiggles ever so slightly in the center if you shake the pan a little. Kill the heat, leave the oven door ajar and leave the cheesecake bars in there to cool until you can safely handle the pan with your bare hands. Let the bars cool completely at room temperature and then place them in the fridge until they are completely chilled, at least 2 hours but preferably overnight, before attempting to cut them. When ready to serve, or when you can’t resist any longer, delicately lift the bars from the pan by pulling on the parchment paper overlaps and place them onto a large cutting board. Cut the bars with a sharp knife, making sure to wipe the blade clean between each cut for cleaner looking bars. 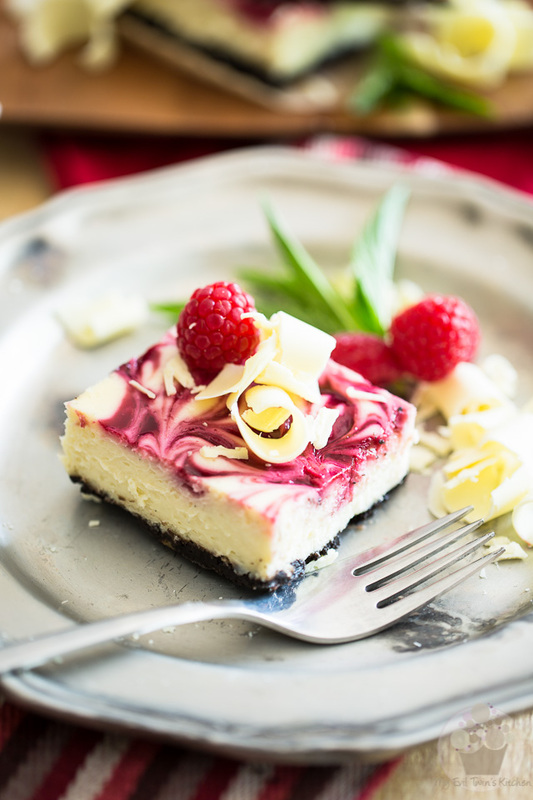 Garnish with fresh raspberries, fresh mint leaves and a few shavings of white chocolate, if desired. I find that these bars are at their best eaten right out of the ice box, and I strongly recommend that you serve them with a fork and plate. Keep any leftover bars in an airtight container in the refrigerator for up to a week. 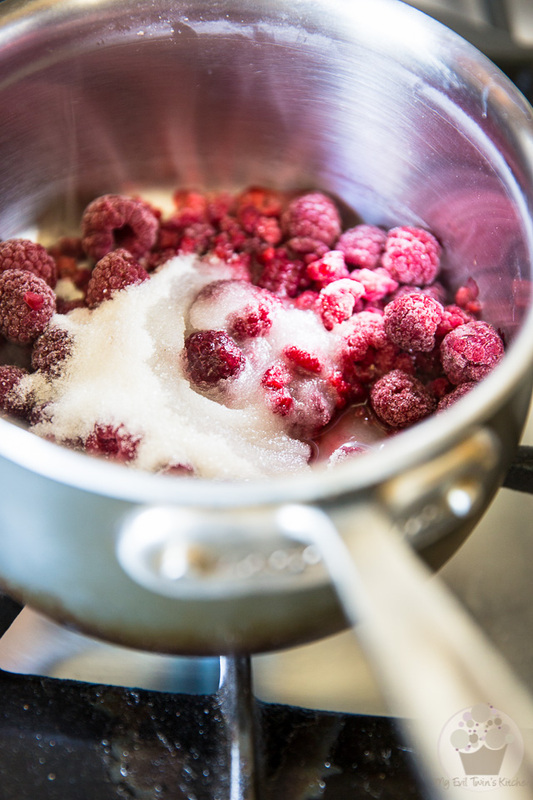 Combine the raspberries, sugar and lemon juice in a small saucepan; bring to a boil over medium heat and cook until the raspberries are completely reduced to a puree. Set aside to cool completely while you work on the crust and filling. 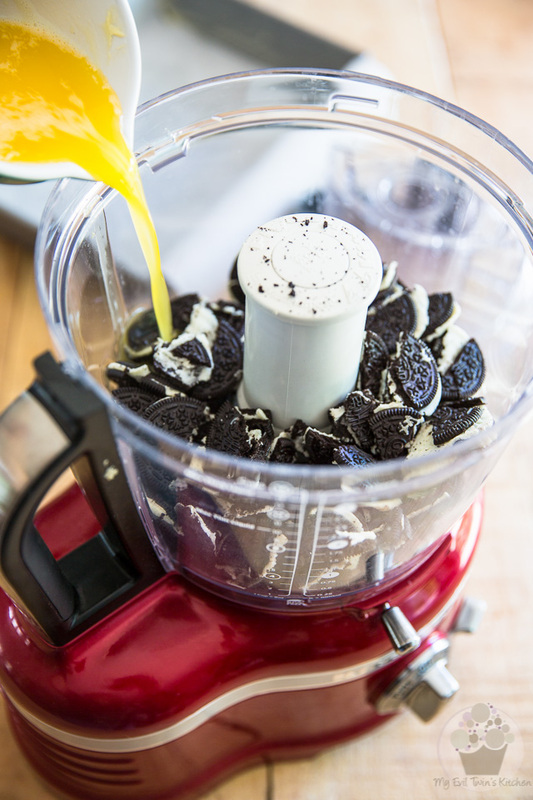 Place the oreo cookies and melted butter in the bowl of your food processor; process until reduced to fine crumbs. Press the mixture firmly at the bottom of the prepared baking pan. Set aside. 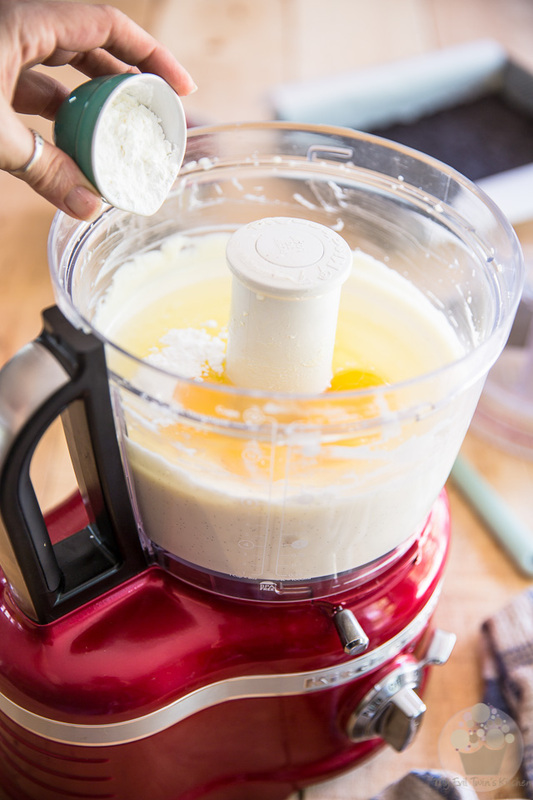 Combine the cream cheese, sour cream, granulated sugar, lemon juice and vanilla seeds in the well rinsed bowl of your food processor. 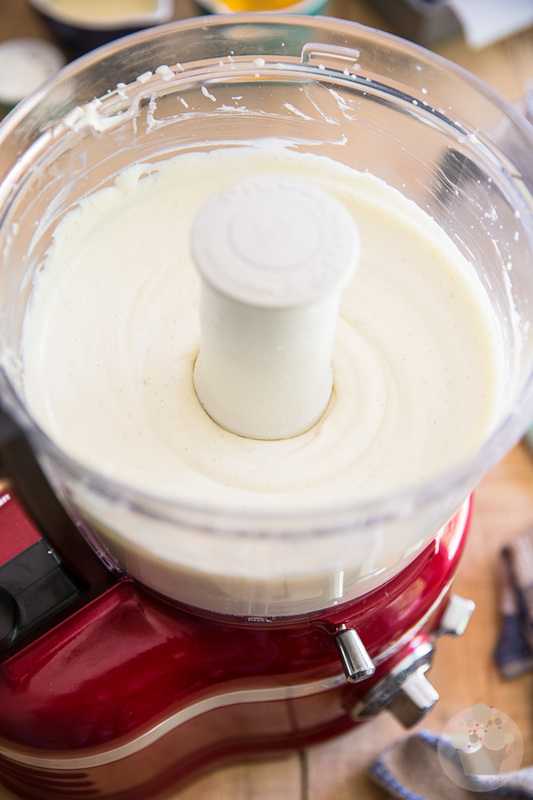 Process until the mixture get super smooth and creamy, about 3 minutes. Stop the motor to scrape the sides once or twice to make sure every last bit gets incorporated. Add the eggs and corn starch and resume beating until well incorporated, about 30 seconds. Pour the mixture over the reserved crust and spread it all the way to the sides. 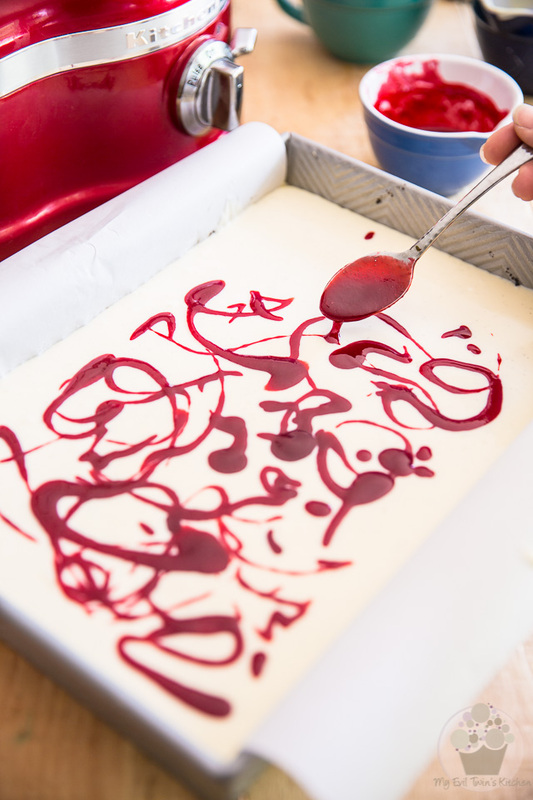 Delicately drizzle the raspberry mixture all over the top of the cheesecake batter with a spoon and then, make little swirls in the mixtures with the help of a wooden skewer. Do not go all the way to the bottom with that skewer so you don't end up damaging the crust. Bake for about 40 minutes, or until the filling is set and golden brown around the edges and jiggles ever so slightly in the center if you shake the pan a little. Kill the heat, leave the oven door ajar and leave the cheesecake bars in there to cool until you can safely handle the pan with your bare hands. When ready to serve, delicately lift the bars from the pan by pulling on the parchment paper overlaps and place them onto a large cutting board. Then, cut the bars with a sharp knife, wiping the blade clean between each cuts. Girl. You are KILLIN me with these cheesecakes!! When I was little I refused to have cake at my birthday. If it wasn’t cheesecake I wanted no part of it… (doesn’t help that I’m lactose intolerant haha!) but I will gladly pop some pills to indulge in this. My proudest baking accomplishment was when I made my first cheesecake… Take a wild guess what flavor I made… Yup. 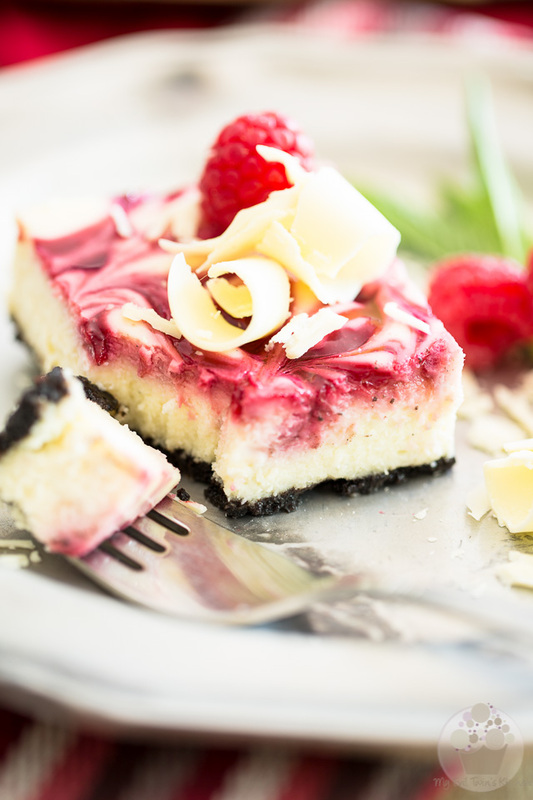 White chocolate raspberry with Oreo crust. I swear we have the same brain! I think I’m gonna make the lemon white chocolate cheesecake bars of yours for my birthday cause I am ALL about the lemon. Keep rockin it Sonia! Ha! You and I must be sisters separated at birth or something. We definitely are on the same brain wave! And if you indeed make those bars for your birthday, I can guarantee you’re not going to regret it. They are truly HEAVENLY! Are you planning on turning them into a cake? I’m pretty sure it could be done! Hmpft… now I’m thinking I want to give it a try myself. Why oh why aren’t desserts good for your health? 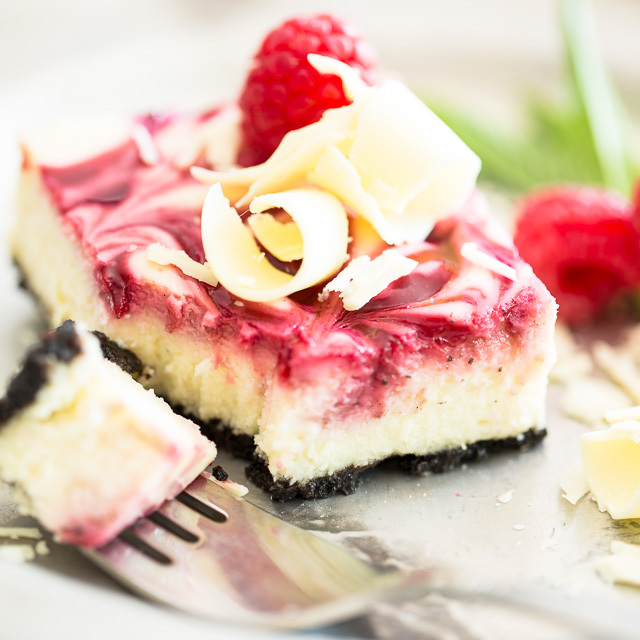 If only cheesecake could help you lose weight… hey, a girl can dream, can’t she? Whoa. Wait. How would one go about making that into a cake?? It shouldn’t be too complicated! I’ll have to look into that and get back to you… when’s your birthday exactly? July 28th… I sure hope that’s enough time!! That’s a little bit short for me to actually test it, but looking at the recipe, I think that I would simply double the amount of cheese batter and add a few tablespoons of corn starch to it, and maybe do only half the top cookie layer. Then I would increase baking time to 65-75 minutes and let the cake cool in the oven for about an hour before taking it out. I’m thinking that this should do the trick! Aww man I’m nervous to try! 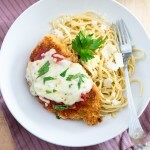 Lol usually I have no problem switching up recipes (almost always do) but this one makes me nervous! I may just stick to the bars 😉 lol if I may ask, what is your favorite desert that you have on evil twin? No way!!! You can’t be asking me that!!! How am I supposed to choose just one? There are way too many to pick only one. I simply cannot do it. BUT, I have to say that those lemony bars we’re talking about were right on top of my list of all-time favorites. That and my no-bake white chocolate lime cheesecake.